What is dal without tadka, poori without its rich brown crust? The story of edible oil, a commodity indispensable for any meal. It costs the country roughly $10.5 billion in annual forex outgo, yet hardly attracts the kind of editorial commentary that oil, gold, mobiles, coal and other big-ticket import items do. Like petroleum, it is also shipped in tankers — typically Handymax/Supramax vessels of 15,000-50,000 tonnes capacity — and processed in giant refineries. But unlike regular “commodities”, there are strong regional patterns and preferences dictating its consumption. And most important, it’s indispensable to any meal, even while being a rare food article that has recorded very little price increase in recent times. India is the world’s second largest consumer of edible oil — the “other oil” that is used to deep fry our pooris and rohu fish, make the tadka/chounk tempering to add flavour and aroma to dals, and impart necessary texture, mouth-feel and bite to biscuits and cookies. Like petroleum, this one, too, is largely imported: Out of the country’s 20-21 million tonnes (mt) annual consumption, next only to China’s 34-35 mt, 14.5-15.5 mt is imported. The evolution of this consumption is itself a story worth telling. Traditionally, Indians used broadly two types of edible oils. The first was ‘vegetable’ oils obtained from crushing local oilseeds — mustard in northern and eastern India; groundnut in Gujarat, Maharashtra, Karnataka and Andhra Pradesh; sesame and groundnut in Tamil Nadu; and coconut in Kerala – in kachchi ghanis. These were mostly bullock-driven cold presses that extracted the oil at below 50 degrees Celsius, the normal heat produced through friction. Besides, there were the bigger mechanical expellers or screw press plants that compressed the seed at temperatures going up to 100 degrees Celsius. The second cooking oil medium was ‘animal’ fat, mainly desi ghee from milk. This was an expensive option households could exercise, maybe once a week or to make mysore pak and ladoos on special occasions. The first major revolution came in 1937, when Hindustan Unilever (then, simply Lever Brothers) launched Dalda. This was essentially vanaspati or hydrogenated vegetable oil. The purpose behind hydrogenation — adding hydrogen to convert “unsaturated” liquid fats into “saturated” solid fats — was to harden or raise the melting point of the oil, yielding a product mimicking desi ghee. Just as ghee, its higher melting and smoke point (at which the molecules start breaking down) made vanaspati better suited for deep frying than normal vegetable oil. The samosas and vadas fried in vanaspati were crispier. Cooking in it also extended the shelf life of foods, not a small consideration when few homes had refrigerators. Above all, it was cheap; even today vanaspati retails at under Rs 80 per kg, as against Rs 350-plus for ghee. By the 1950s, many others — from DCM (Rath) and the Sahu Jains (Hanuman), to Wipro (the company was originally Western India Vegetable Products Ltd) — had their hydrogenated oil brands. They all marketed it as “vanaspati ghee”, only to technically distinguish from desi ghee (a la vegetable fats-based “frozen desserts” versus “real” ice-cream). The second revolution happened with solvent extraction and refining. These processes, unlike normal expeller-pressing and filtering, involved use of chemicals. While with mechanical pressing, only about 85 per cent of the oil from groundnuts could be recovered, the use of solvent (edible-grade hexane) could take it to 99 per cent by squeezing out even the residual oil in the expeller cake. The raw edible oil was further refined — that is, de-gummed (to remove gums, waxes and other impurities), neutralised (to remove free fatty acids), bleached (to remove colour) and de-odourised (to remove volatile compounds) — by treating with sodium hydroxide and other chemicals. The first solvent extraction plants came up during the late 1940s, mostly in Gujarat’s Saurashtra region for extracting oil from groundnut cake. By the early Fifties, Ahmed Umar Oil Mills in Mumbai had also introduced refined groundnut oil under a once-iconic Postman brand. In 1962, a company called Foods Fats & Fertilisers Ltd established a solvent extraction plant to produce oil from rice bran, a by-product of paddy milling. This was at Tadepalligudem in Andhra Pradesh’s West Godavari district, a rice bowl. But the real solvent extraction boom took place with soyabean cultivation spreading in Madhya Pradesh, Rajasthan and Maharashtra from the late-Seventies onwards. “With this technology, you could process even low oil-bearing materials like soyabean, rice bran and cottonseed cake, which wasn’t possible with mechanical pressing,” says B V Mehta, executive director, Solvent Extractors’ Association of India. This period also coincided with the Yellow Revolution spearheaded by the National Dairy Development Board (NDDB). Acreages under mustard, groundnut, soyabean, and also other oilseeds like sunflower and safflower, rose considerably. Refined sunflower oil particularly saw an explosion of brands: ITC’s Sundrop, Hindustan Lever’s Flora, and Sweekar of Bombay Oil Industries (which also sold Saffola refined safflower oil). The NDDB, too, had a range of both filtered and refined groundnut, mustard and sunflower oil, marketed in tetra-packs under the Dhara brand. In the early to mid-Eighties, India was importing some 1.5 mt of edible oils a year. With domestic oilseeds production climbing from 12.65 mt in 1987-88 to 21.50 mt in 1993-94, the country became near self-reliant. All that changed with liberalisation. The third phase of the Indian edible oil saga is coterminous with the surge in imports, from just over 0.1 mt in 1993-94 to 4.2 mt at the turn of the century and 8.4 mt by 2010-11. In the last oil year ended October 2015, imports totalled 14.42 mt, mainly palm (9.54 mt), soyabean (2.99 mt) and sunflower (1.54 mt). This is also mirrored by consumption. Till the early Seventies, groundnut accounted for almost 60 per cent of India’s edible oil consumption, followed by mustard, cottonseed and other domestically produced oils (coconut, sesame, etc). 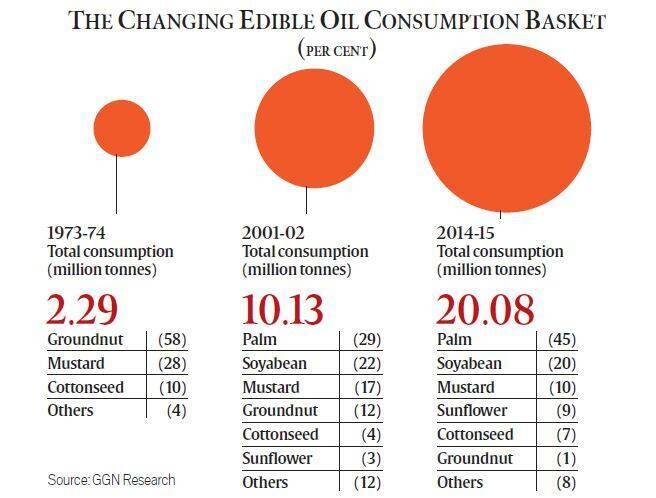 But in 2014-15, groundnut oil’s share had plunged to hardly 1 per cent and mustard’s to 10 per cent. Their place has been taken over by palm oil (45 per cent) and soyabean (20 per cent), with even sunflower registering a significant jump. Virtually the whole of the country’s palm oil consumption is imported, with the ratios slightly lower for sunflower (92 per cent) and soyabean (71 per cent). The nature of the industry itself has changed as a result of this huge shift to imported oils. Much of it today comprises not expeller or solvent extraction units processing domestically grown oilseeds, but mere refineries importing crude palm, soyabean or sunflower oil. There are many corporates now — Ruchi Soya, Adani Wilmar, Cargill India, Bunge India, Liberty Oil Mills, Emami Agrotech and JVL Agro — each with annual refining capacities exceeding 0.5 mt and plants near ports such as Mundra, Kandla, Mangalore, Chennai, Krishnapatnam, Paradip and Haldia. While all this massive quantum of imports in tanker vessels may have turned edible oils into a “commodity” business, what is interesting, nevertheless, is that it hasn’t totally obliterated region-specific consumption patterns and even local oils. Soyabean oil, for instance, is predominantly consumed in the North and the East, but in both regions, mustard remains the first choice. 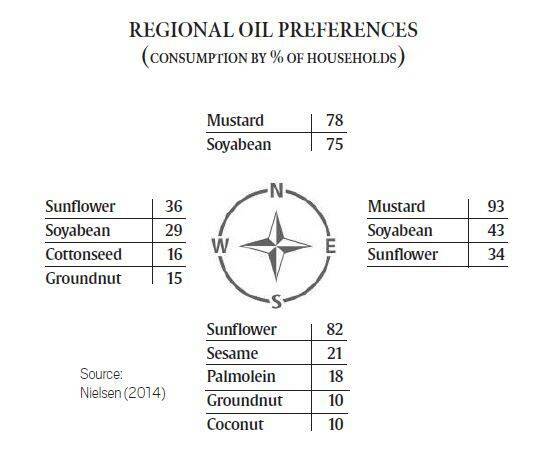 Sunflower oil, by contrast, is popular mainly in the South. In the West, sunflower and soyabean have become the major oils, yet not eliminated groundnut and cottonseed. “Sunflower was already being grown in Karnataka, Andhra Pradesh and Maharashtra, just as soyabean was in Madhya Pradesh. Consumers south of the Vindhyas and MP upwards, therefore, knew about the two oils. Imports only expanded the markets that domestic production had initially seeded,” says Siraj A Chaudhry, chairman of Cargill India, which sells Nature Fresh and Gemini edible oils, besides owning the Rath and Sunflower vanaspati brands that once belonged to DCM and Wipro respectively (Dalda is now with Bunge, yet another US-based commodity trading giant). That still leaves the mystery of palm oil: Where is all the 9.5 mt going? Although some of it gets sold as palmolein through the public distribution system, especially in the South and states like Odisha, not even a third of the palm oil is directly consumed in home kitchens. “It is predominantly used by the food industry — for everything from mithais, namkeens, bread and biscuits to noodles —and quick-service restaurants. It is the cheapest oil and, moreover, amenable to deep as well as multiple frying. Vanaspati manufacturing, too, is now entirely based on palm oil,” Chaudhry, who earlier was at Cargill’s vegetable oil trading desk at Geneva, points out. Being cheap also makes palm oil ideally suited for adulterating other oils, from mustard and groundnut to sesame. “It is a neutral oil, with no aroma of its own and can easily mingle with other oils. Whenever prices of other oils go up, you’ll see a spurt in palmolein sales, much of which is for so-called blending,” admits a refiner, who does not want to be identified. Can there be a fourth phase – a return to indigenous oils – more so with the likes of Baba Ramdev entering the scene? The future for indigenous production lies only in mustard (because of its high oil content), cotton-seed (thanks to the Bt revolution, which has already made it India’s second biggest oil, consumed primarily in Gujarat) and rice bran. “Let’s face it, we are fundamentally uncompetitive in oilseeds and there’s no alternative to imports”, says Chaturvedi. 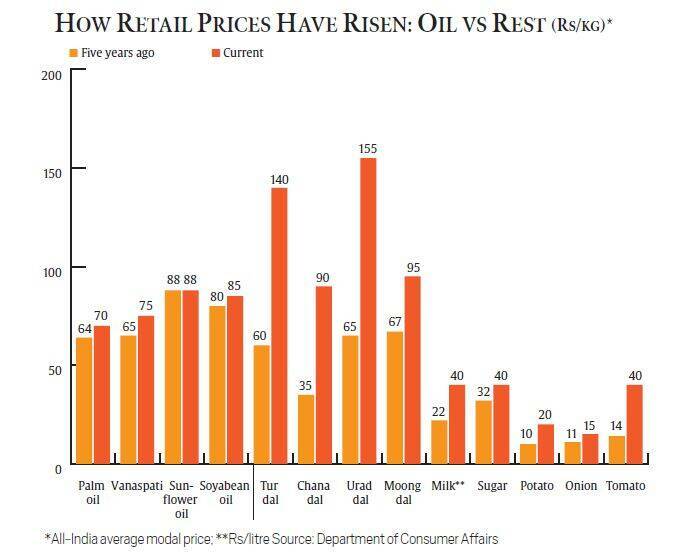 Imports are also the reason why retail prices of edible oils haven’t gone up much in the last five years. The contrast with other foods couldn’t be more. The red matta rice, it is said, follows the Malayali nurse to Abu Dhabi and Bahrain, just as the Tamil IT professional cannot do without nallennai or sesame (gingelly) oil even in the Bay Area. But selling a premium traditional oil is still a challenge, in a market dominated by a few national/global branded players dealing largely in cheap imported palm, soyabean and sunflower oil. One regional brand that has managed to survive the onslaught of imported oils is Idhayam, Tamil for hriday or heart. With sales of about 1,300 kilo-litres a month, it claims a 60 per cent share of the branded sesame oil market in Tamil Nadu, which also has other names such as Karmegam, Sastha, VVS, Anandham and Pasumark. “Eighty per cent of our sales are in TN and another 10 per cent in other states. The balance is exported, mainly for the Tamil diaspora in the US, Canada, the UK and Australia. We only do expeller-pressed and filtered oils and are not into solvent-extracted and refined oil,” says V R Muthu, CEO of the Virudhunagar-based VVV & Sons Edible Oils Ltd, which owns the Idhayam brand. Competing with imported oils isn’t easy. “Today, a one-litre pouch of my oil is selling at about Rs 190, as against Rs 90 for refined sunflower oil and Rs 70 for palmolein. But in 2013-14, a poor crop led to my prices going up to Rs 300 per litre and my monthly volumes falling to 900-1,000 KL. I can afford to be twice as expensive as sunflower oil; beyond that becomes tough,” he admits. Yet, even in the worst of times, Idhayam has retained 70 per cent of its customers. Muthu attributes this to two reasons. The first is the brand’s strength and recognition that “my product is not adulterated with refined rice bran oil or palmolein”. The second has to do with the oil itself: “Tamilians, wherever they are, need it in their fish, brinjal, potato or yam kuzhambu (curry). They know the taste of food cooked in oil that is physically extracted and filtered after crushing sesame seeds with 2 per cent karupatti (palm-jaggery) added”.